Samsung isn’t noted for their computers but that doesn’t mean they aren’t existent. 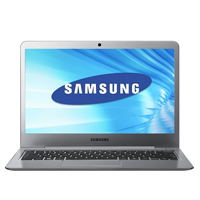 The Samsung 5 Series is a super sleek and thin looking PC laptop. It sports a Intel core i5-2467M processor, 4GB DDR3 RAM, 500GB Hard Drive, 13.3” Screen, Intel HD 3000 Graphics, Windows 7 Home Premium 64-bit OS, and looks very smooth. That’s this laptops strong point, it’s almost like a netbook it’s so think and lightweight. Just 3.23lbs and 12.4” in length – it is a breeze to carry this laptop around. But you also get the power of all the laptops we listed above, in a super sleek and portable version. Up to 6.5 hours on a full battery charge.